Another story about a pedestrian being injured by a cyclist breaking the law. 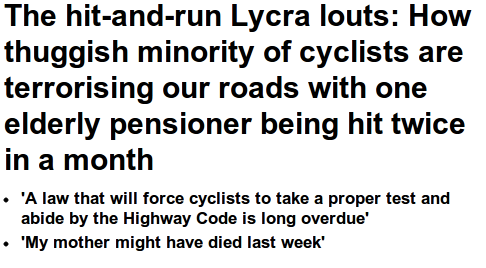 You hear the same story repeated over and over, cyclists are dangerous, a menace on our roads, terrorising pedestrians. A lot of people are talking about the danger posed to pedestrians by cyclists but facts and figures are often missing. I suspect that this issue is being discussed by the public and media because of the increased use of non-segregated cycle facilities that permit cyclists to use the same pavement as pedestrians. These put cyclists and pedestrians in close proximity which will lead to more conflict. Cyclists can and do injure pedestrians, 2.5 people on average per year (1998 to 2009) have been killed by cyclists, an average of 57 per year (1998 to 2009) are seriously injured and a 262 are slightly injured on average per year(1998 to 2007). This number obviously needs to be reduced, these incidents reflect badly on cyclists and the reporting of such incidents make them seem to be much more common than in reality. I’m always shocked that the 725 pedestrians who are killed on average each year (1998 to 2009) by motorised vehicles doesn’t cause more outrage. I suspect that this is down to so many of us driving, people can relate to car drivers however when it comes to cycling it is an unknown, fewer people cycle, there is no familiarity and they are often demonised. There is a staggering difference in serious injuries caused by different modes of transport. All the data for this chart is on a Google Spreasheet here. The number of serious injuries caused to pedestrians by different modes of transport since 1997. Are cyclists more of a threat to pedestrians than motor vehicles? The answer in absolute terms is very clearly no. The average of 2.5 pedestrian deaths from cyclists vs 725 pedestrian deaths from motor vehicles per year clearly shows that motor vehicles are a much larger threat to pedestrian safety than bicycles. There are complications though and the answer is never this simple, we know that not many of our journeys are made by bicycle, we need to look at the data over distance travelled for each form of transport. The number of serious injuries caused to pedestrians by different modes of transport per billion km travelled since 1997. The data presented in this graph shocked me when I first saw it, serious injuries to pedestrians per km travelled are at a similar level for bicycles as motor vehicles and were higher in 2005 and 2009. This result isn’t the final picture though, we need to consider the parts of the road network where cyclists and pedestrians are not permitted. This data was reworked under the assumption that there are no pedestrian injuries/deaths on the motorways caused by motor vehicles or cyclists (which are not allowed). By including motorway driving in the annual distances travelled we artificially reduce the calculated injuries/km because there is no/very little risk to pedestrians on motorways from motorised traffic and yet a lot of motorised traffic uses them. Cyclists are not permitted on motorways so there is no reduction needed in their distance travelled. This increased the number of serious injuries per billion km for motorised vehicles but left the cycling result the same. I’m interested in knowing if this is a reasonable assumption to make. The number of serious injuries caused to pedestrians by different modes of transport per billion km travelled since 1997 excluding motorway travel. The general trend remains the same and the number of serious injuries per billion km travelled is comparable between bicycles and motorised vehicles with an average of 13.1 serious injuries/billion kilometres for bicycles and 18.7 serious injuries/billion kilometers for motorised vehicles. In conclusion, bicycles cause far fewer injuries than motor vehicles but on a per km basis, cyclists are lower but surprisingly still in the same order of magnitude as motorised vehicles. This entry was posted in cycling on September 9, 2012 by Matt. Matt – a fascinating and much needed look at the statistics. I only wish the authorities did the same thing. I’d been searching the internet for many hours looking for such figures before I came across your blog. Many thanks. Your figures make cycling look rather more dangerous for pedestrians than cyclists relatively light weight (compared to cars) would suggest. Another way of looking at the figures would be to consider pedestrian deaths per cycle trip. A cyclist’s shopping trip would be less dangerous for pedestrians than a motorist’s shopping trip for instance. The other thing to consider is that we know that pedestrians will move away from motor vehicles but don’t react in the same way to cyclists. Pedestrians are “at fault” for a surprisingly high proportion of their accidents and the pedestrian killed by a cyclist crash I investigated when working for a local authority involved the pedestrian stepping into the path of the cyclist. There is something to be said for shared-use paths being a big factor in the rate of riding-walking collisions. It’s where relatively inexperienced riders are put. Nothing against them choosing to go there, the road isn’t appealing! But this will put people in differing modes in conflict. To me, the “casualties by vehicle type” means we need ot focus on reducing poor behaviour in cars. And, as important, the “casualties by vehicle type per billion km” means we should also build segregated infrastructure. A doubly-whammy of success would be to build segregated infra which reduces roadspace, known to help to slow motor vehicles down, reducing poor behaviour in cars! Cars travel faster than bikes, on average, so another comparison could look at injuries and deaths per hour.